Pacific Northwest and one of the largest on the West Coast, was christened in June at the headquar- ters of Manson Construction & En- gineering Company in Seattle. The christening cermony started when a helicopter flew Henry Si- monson, Seattle Port Commission president and Manson Corporate treasurer Tamara Amundsen, to the Wotan's aft helicopter pad. Mr.
Simonson was the principal speak- er and Ms. Amundsen christened the vessel. Peter S. Haug, company presi- dent. The Wotan is the 14th floating crane in the company's modern fleet. The Wotan is rivaled in size on the West Coast only by the Betty L, a floating crane being operated by the Ocean Beach Outfall Construc- tors in San Francisco, a joint ven- ture of which Manson is also a part- ner. 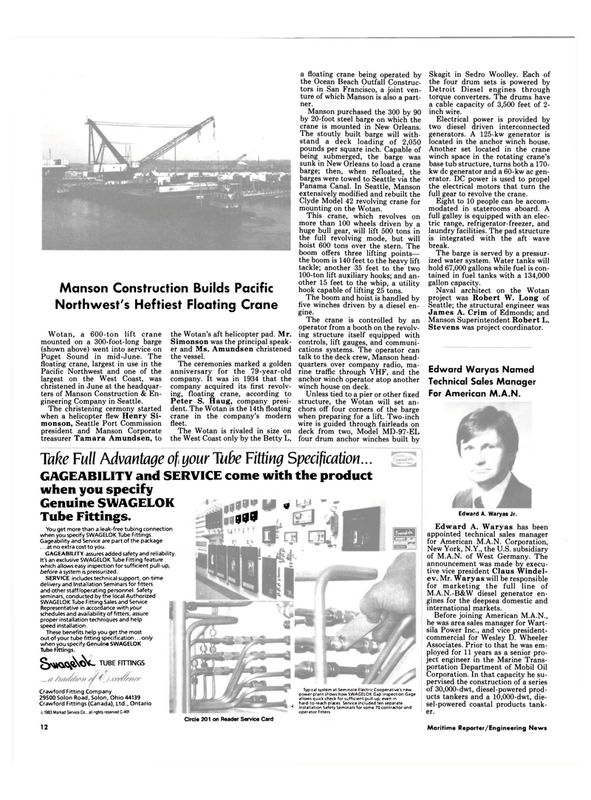 Manson purchased the 300 by 90 by 20-foot steel barge on which the crane is mounted in New Orleans. Clyde Model 42 revolving crane for mounting on the Wotan. This crane, which revolves on more than 100 wheels driven by a huge bull gear, will lift 500 tons in the full revolving mode, but will hoist 600 tons over the stern. The boom offers three lifting points— the boom is 140 feet to the heavy lift tackle; another 35 feet to the two 100-ton lift auxiliary hooks; and an- other 15 feet to the whip, a utility hook capable of lifting 25 tons. The boom and hoist is handled by five winches driven by a diesel en- gine. The crane is controlled by an operator from a booth on the revolv- ing structure itself equipped with controls, lift gauges, and communi- cations systems. The operator can talk to the deck crew, Manson head- quarters over company radio, ma- rine traffic through VHF, and the anchor winch operator atop another winch house on deck. Detroit Diesel engines through torque converters. The drums have a cable capacity of 3,500 feet of 2- inch wire. Electrical power is provided by two diesel driven interconnected generators. A 125-kw generator is located in the anchor winch house. Another set located in the crane winch space in the rotating crane's base tub structure, turns both a 170- kw dc generator and a 60-kw ac gen- erator. DC power is used to propel the electrical motors that turn the full gear to revolve the crane. Eight to 10 people can be accom- modated in staterooms aboard. A full galley is equipped with an elec- tric range, refrigerator-freezer, and laundry facilities. The pad structure is integrated with the aft wave break. The barge is served by a pressur- ized water system. Water tanks will hold 67,000 gallons while fuel is con- tained in fuel tanks with a 134,000 gallon capacity. M.A.N.-B&W diesel generator en- gines for the deepsea domestic and international markets. You get more than a leak-free tubing connection when you specify SWAGELOK Tube Fittings. Gageability and Service are part of the package . . . at no extra cost to you. GAGEABILITY assures added safety and reliability. It's an exclusive SWAGELOK Tube Fitting feature which allows easy inspection for sufficient pull-up, before a system is pressurized. Representative in accordance with your schedules and availability of fitters, assure proper installation techniques and help speed installation. Typical system at Seminole Electric Cooperative's new power plant shows how SWAGELOK Gap Inspection Gage allows quick check for sufficient pull-up, even in hard-to-reach places. Service included ten separate * Installation Safety Seminars for some 70 contractor and operator fitters.